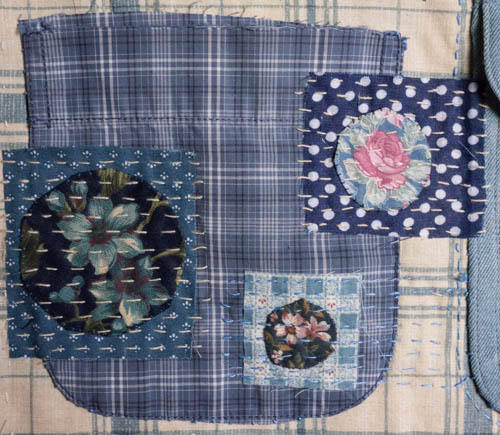 6.6.2014 [Cont'd from 5.29.14] I continue to work on my Spirit Cloth 101 project, aka "Pocket Haven." I was thinking that the end was in sight the other night as I add some stitches to the upper left pocket and tried a couple star stitches to add body to the in-between (see photo below). Then it started to look like a big jumble, not a well integrated composition. 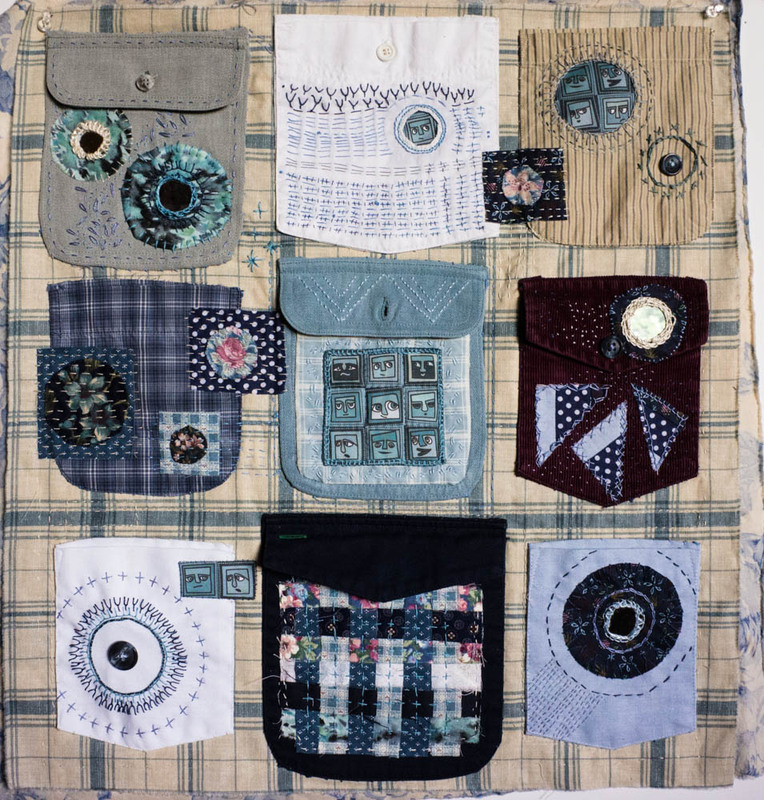 It's a sampler, yes, an experiment, yes, but I'd also like it to be an experiment of the whole, not a mish-mash of random embellishments. This led me to pause and consider a border... which led me into my current "just shoot me" status. Upper right. 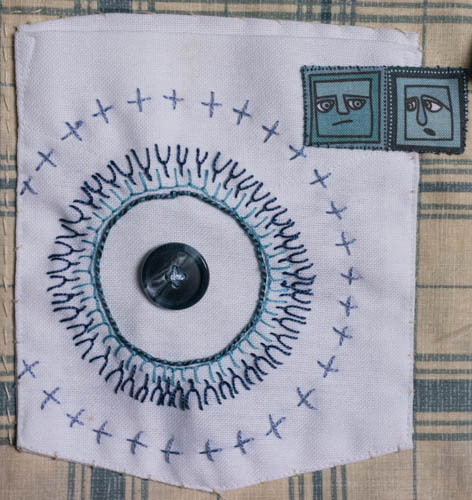 I cut another porthole for my pocket refugees, with a blanket-stitch edge and running stitches all around. Added a "sun symbol," with a button and chainstitching, plus some Xs/crosses for added blessing/magic. The restless souls who arrive at Pocket Haven deserve all the advantages I can design for them. Middle left. 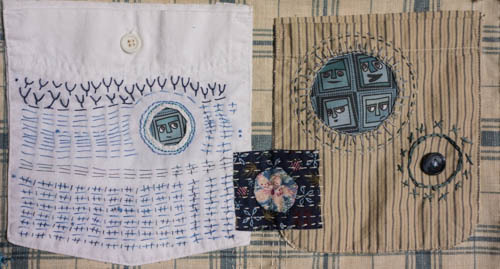 Last time I mentioned how charmed I was by the sashiko-style stitching on the appliqued patch (photo above). 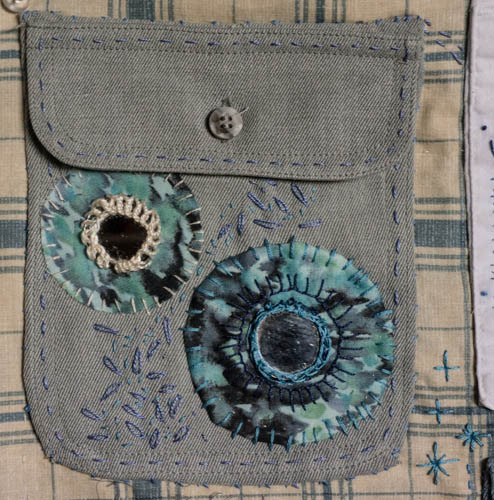 So I did some more on this raggedy blue pocket. It's becoming more of a freeform garden than the center-bottom pocket. Lower left. I added a button. It's slightly off-center. Damn. Well, everything is slightly off, isn't it? I added a patch from my Lookout fabric. These two guys look like they might be debating whether they want to explore this bright solarium or not. For my border, I decided to hand-piece a checkered pattern. Borders are important. They demarcate the boundry between chaos and order. In traditional clothing design, proper attention to how edges are finished helps keep away disease-carrying spirits or distracts the evil eye. 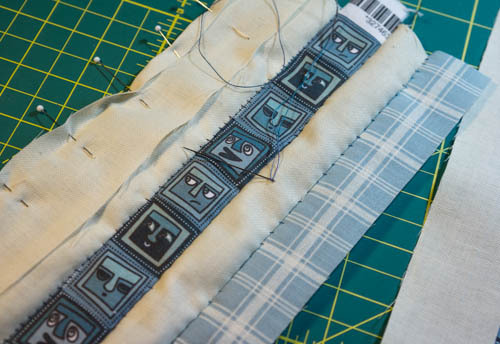 The most efficient way to patch checks together is to sew long vertical strips, then cut them horizontally into pieced strips... Okay, my perimeter is about 80" around and if I can get 9 horizontal strips from my vertical strips (1" + seam allowances), I need to sew 9 vertical strips together (oh, my aching brain). I could whip this up fast on the machine, but that might ruin the soft, hand-sewn feel of the entire piece. I want a picket fence, not a brick wall. Last night's work is below. It isn't hard. It moves right along, but it's boring. I need to get over that attitude. It's like clock-watching -- clock-watchers have the longest workdays. But I'm impatient to see how it's going to look.